As a leader in Space Architecture, XArc has provided the knowledge and skills to complete architecture projects for a broad range of clients all over the world. Take a look at some of our featured Case Studies, ranging from the Virgin Galactic Terminal and Hangar Facility at Spaceport America, to Lunar Outpost Planning and Design. Operational scenarios, technologies, and human and robotic performance feats associated with planetary cave exploration can be benefited by terrestrial analog mission testbeds. Certain geo-morphologic features found at the Nisga’a Memorial Lava Bed Park in British Columbia, Canada can serve as a terrestrial analog site for science research and testing of mission operations to lunar subsurface sites. 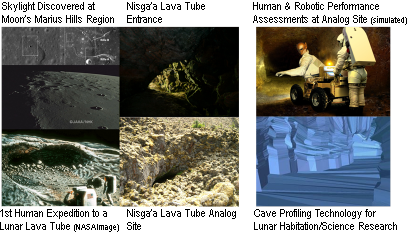 Proposed is an analog mission investigating required science measurements with human performance objectives simulating robotic and human “first contact” with a lunar lava tube. The proposed geographic location for conducting the analog studies is within the protected area of the Nisga’a Lava Bed in proximity to the Tseax River Cone or Aiyansh Volcano where unmapped lava tubes exist. Scope and Objectives of the Research: The idea is to get some understanding of first robotic and human contact with a lunar lava tube through the use of comparable terrestrial lava tube features. Basic scientific understanding of the features is necessary to locate them on the Moon as well as techniques of entering and examining them robotically and by Astronauts. Proposed Methodology: Essentially we simulate a first scientific expedition to a lunar lava tube. By simulating missions to the features on Earth researchers can better understand direction and techniques of exploration of those features on the Moon. An international team of planetary scientists, caving and mining experts, robotic experts, and human performance experts has been assembled to investigate the best path for technology development and how sampling and science can be done on the lunar surface and underground. XArc Corp is responsible for leading team coordination and program management, lava tube characterization for habitation technology, mission operations and human performance research. Development of a lunar site characterization instrument for measuring solar wind plasma interactions with lunar dust at near surface heights. Characterizes the lunar dusty plasma environment at near surface elevations using high fidelity direct measurement of the charged lunar dust environment to determine electron temperature, density, and electric potential. Allows flexibility for integration of the instrument as a secondary payload into a variety of governmental agency and/or commercially planned lunar lander missions. Enables a “network” of lunar surface solar wind plasma-dust interaction measurement sites using lunar lander secondary payload manifesting opportunities. Provides risk reduction in mission planning through understanding and quantification of potential charged dust impacts on operational designs for lunar outpost systems. Provides data for the evaluation of alternative dust management and removal techniques.